8:15 – After a long day at work and a trip to the grocery store, I’ve put meatloaf in the oven, and I’m ready to listen to the Buccos! What the heck… I’ll try a live game log. I’m listening on XM Radio tonight, so I’ve got the Cardinals’ feed. Bring on John Rooney. 8:16 – Play ball! Duke @ Wellemeyer. Njyer Morgan to the plate. The lineup shows that Ramon Vazquez will be starting third base in place of Andy LaRoche. LaRoche had a nice spring, but he’s struggled in the opening two games, going 0 for 5 with 3 defensive errors. 8:25 – The Pirates tried to put a first inning rally together. They caught a bad break when Ryan Doumit hit a ground-rule double to deep center. If the ball hadn’t left the field of play, Freddy Sanchez would have easily scored from first. After 1/2 inning, Pirates 0 – Cardinals 0. 8:30 – I’m really hoping that Zach Duke turns a corner this season. He starts with a walk. 8:31 – Kahlil Greene grounded out, 5-4-3. Operation: Shut Down Pujols begins. 8:32 – Struck him out! Went down looking. 8:39 – The good guys got on the board first! Moss singled. Vazquez walked. Wilson singled to score Moss! Let’s keep the rally going! 8:41 – After Zach Duke struck out, Nyjer Morgan continues hit hot streak by hitting at RBI single! 8:43 – Freddy Sanchez hit a bloop single, and Jack Wilson read the hit perfectly to leave 2nd on contact a score a run! The Bucs have 3 on the scoreboard, and the Cards sent a pitching coach to the mound! 8:47 – After a Nate McLouth Walk, Ryan Doumit hit an RBI single to right. Unfortunately, he was picked off first base (9-4-3). Tough way to spoil a second inning rally. Adam LaRoche fouled out to third to end the top half of the 2nd inning. 4-0 Pirates. Let’s go Zach! 8:57 – The Cards scored in the bottom of the 2nd, but it could’ve been much worse. Ryan Ludwick got on thanks to a Doumit catcher’s interference. A stolen base and a Rick Ankiel single drove in Ludwick. The key play was a David Freese flyout to Nyjer Morgan. Thanks to a wise defensive shift, the play was an easy out. With a standard defensive alignment, the play would’ve resulted in a hit in the gap and quite possibly an extended Cards rally. 4-1 Bucs. 9:04 – The Pirates got the run back in the top of the 3rd. Moss doubled. Vazquez grounded out, sending Moss to 3rd. A Wilson single drove him in. That’s Wilson’s 2nd RBI of the night. 5-1 Bucs. 9:11 – 3 up. 3 down. One thing that makes this Pirate lead even better is the fact that my meatloaf is ready. Yum. 9:28 – Not much news from the fourth. Pujols made an A+ defensive play to retire Adam LaRoche. Duke retired Pujols again in the bottom half of the inning. Still 5-1. 9:37 – Through 5 innings, Sanchez, Moss, and Wilson are all 3-3. Doumit is 2-3. Not bad. 9:40 – Duke struck out Ankiel, but a Doumit passed ball allowed Ankiel to reach first base. I was worried about this, since we went K-2-3 three times yesterday. 9:46 – The Cardinals scored one in the bottom of the fifth. Great play by Freddy Sanchez to pick up a ball deflected off Adam LaRoche’s glove and throw to the pitcher to get Rasmus out at first. 5-2 Bucs. 9:53 – Put 2 more on the board! Freddy Sanchez “doubled” (sounded more like a single and an error) and Nate McLouth got in first hit of 2009 in a homer to right field. Mmmm… 7-2 Pirates! 10:30 – Grabow replaced Duke, and we’re through 7. Still 7-3. 10:41 – Albert Pujols records his 700th career walk. Congratulations? 10:57 – Jack Wilson singled in the 9th to end his night at 4-5. 3 outs away from the W! 11:07 – Nothing’s easy. Tyler Yakes looked bad. Thankfully JoeThurston made a boneheaded baserunning mistake. 11:08 – Enter Mad Capper. 11:11 – Capps gets hit (very) hard, but McLouth robs a homer at the wall! 2 down. 11:13 – Raise the Jolly Roger! No doubt about it. 7-4 Pirates. We’re 2-1! I was in St. Louis just a few weeks ago. 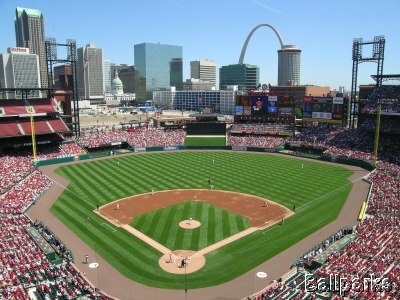 It’s a nice town, and Busch Stadium is beautiful. I wouldn’t mind being out there tonight.